Condura is fast approaching and running 21k without training is no joke. I don’t think I can wing it this time. Time to call on reinforcements. The great thing about being in a running group is that you can always depend on others to help motivate you. One of my Happy Feet co-member, James, did exactly that. 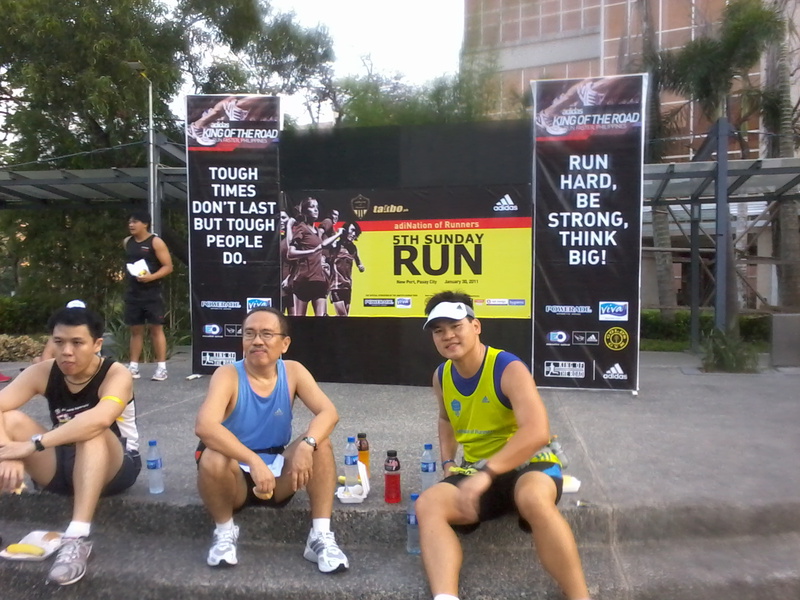 He told me that he can run 15k with me during the ANR 5th Sunday event w/ Sir Mon, who we fondly call Master 🙂 I decided that it’s just right that I make that event my 1st fun run for 2011. For one, my Takbo.ph family will be there. Friends from this community were chosen as team leaders for different training grounds. I also am a part of the Ortigas group, although I was formerly from BHS, but had to change groups as I wasn’t able to attend their sessions anymore. At 430am, I readily got up and got ready for my 1st early morning run in 2011. As I slowly prepared my stuff, I realized that I wasn’t used to this life anymore. I really hate waking up early. I prepared my water bottle, hydration belt, granola bar and my extra shirt. But as soon as I left, I noticed that I wasn’t able to grab my bottle, granola bar and extra shirt. Sigh…this will be a long day. I got to Newport at 536am. James and Master Mon were already doing their warm up run. I joined them shortly for a quick 1.4k warm up before heading towards the starting line of the event. Feeling giddy and excited, I guess this is the effect of endorphins, I greeted and hugged friends who I haven’t seen in ages, got my bib from Argo who thankfully had an extra one and then joined the crowd by the starting line. The feeling was amazing. 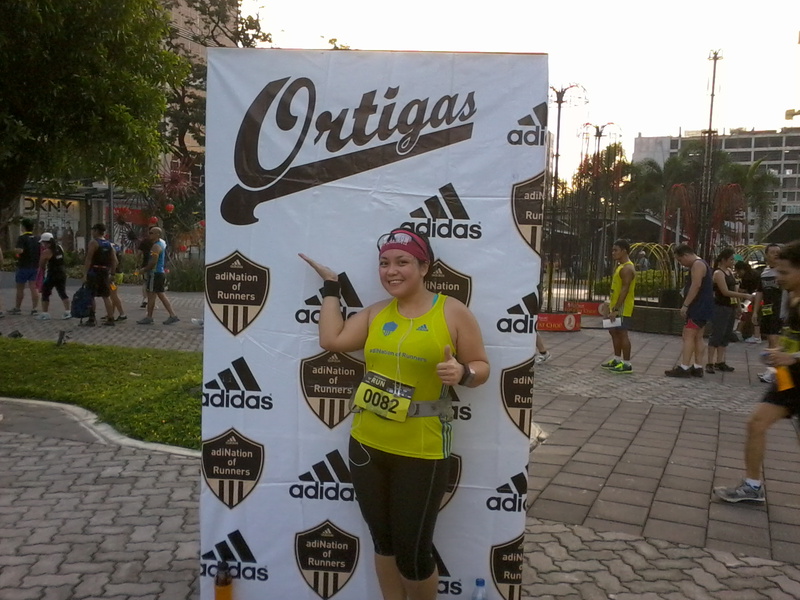 I felt re-energized and ready for the run. James was targeting a 30min, 5k which I felt was too ambitious for me. We then settled for a 35min goal. The route was a simple 2-loop around the Newport parking areas, out by the terminal 3 airport road and back to the finish line. 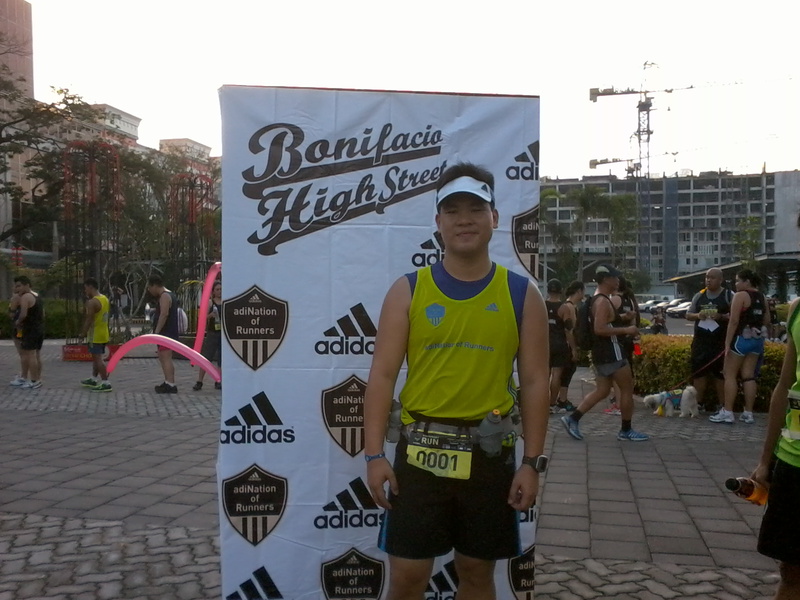 I really enjoyed the 1st 2kms of the race. Our pace was steady at 6:15-6:19. There were no feelings of chest pains, no side stitches, no pain on my knees. It was just me and the exhilarating feeling of “YES, I can still do it”. We were making good time even if we had to stop for a minute to catch our breath. Stopping for a minute during a 5k run? Unheard of. But I did it without shame. I had to give in to the urge of my body. I remember saying to myself that I was freaking tired but it had to be done. I needed to finish the race. James and I sprinted the last 100m to the finish line. We were satisfied with our time of 32:07. Not a PR but still better than my training runs. He used my pride against me. I HATED, no I still HATE, that radio commercial. I was shocked that he outwitted me and while I was contemplating how to get out of this rut he placed me in, he finalized the arrangements with Jinoe, who was trying so hard not to laugh. Panic and fear gripped me. I was so not ready for this. I begged him to find another runner or at least swap me with someone else but he said the list was final. I seriously wanted to sit down in one corner and sulk. The brat in me was brewing and preparing to go on an all out tantrum. But what can I do? How can I say no? How can I face my friends teasing me that the radio-ad-writer-runner-wanna-be was better than me? What can I do? I can do nothing but to panic and shake from nervousness. Maridol kept on saying you can do it. Marvin said, ok lang yan, kaya mo yan while laughing (what vote of confidence). It’s all good. Payback time from all my Doc Marvz pranks and side comments :p LOL! Z, was as sweet as always trying to keep my mind from the inevitable. Luis and Argo were telling me to just have fun with comments like: It’ll be done in 4 mins Gail. WTF?! Run one full kilometer in 4 minutes?! Are they crazy!? My Garmin registered my fastest pace at 3:03 but I was certain that it was due to the last 60 or so meters sprint I made at the end of the 5k run. I remembered that I still had a pack of GU Roctane and decided that now would be a good time to take it. I took half and gave Maridol half. I hope it keeps my energy up. At the starting line, I was really starting to panic. I felt like my knees were shaking. But it’s too late to back out now w/o making a scene. I slowly accepted what I had to do. I kept thinking why me? Why did they pick me to start the relay? They know that I am an average runner. I never did a sub-60sec 10k. My fastest was a 1:03 and I think it was a fluke. I couldn’t even break my 2:30 record for a 21k or Pikermi distance. Oh gosh, what have I gotten myself into? Yes, I was thinking about these during the 20sec countdown to gun start. And off we go! 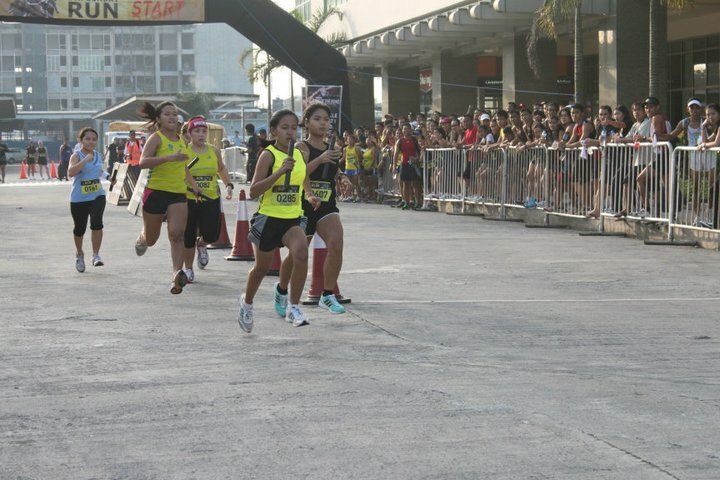 My knees were shaking as I was sprinting to push to gain momentum towards the other runners. But after 200m, I began to feel like my legs were turning into lead. 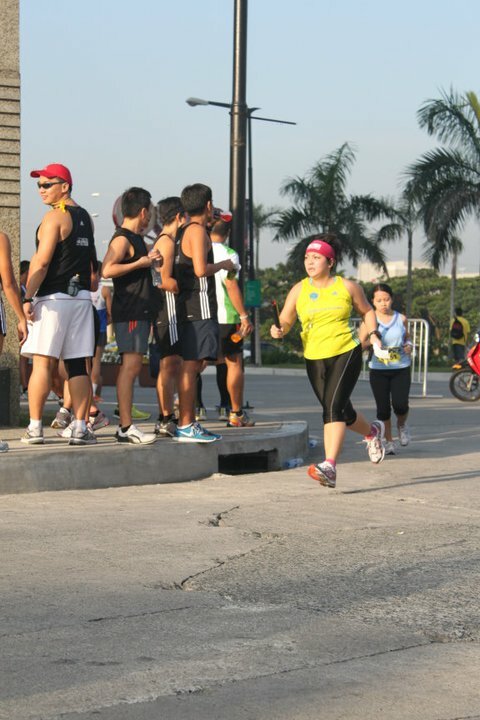 My energy level crashed big time and I was struggling to keep on running. I wanted to stop, just sit down and cry. The bratinella in me wanted to throw the game away and blame other people for putting me in this predicament. But then I thought to myself, no one will really know what happened to me if I did stop as none of my team mates were on the route. It was just the marshals and they seemed oblivious to the fact that I was almost having a nervous breakdown. No way am I going to put up a show without anyone watching. Haha! Fortunately, common sense won and I started to try and run, pushing myself to put one leg after the other and just slowly gain distance. Up ahead, I saw one runner walking, more of limping. She seemed to be in pain. As I was passing her by, I asked what was wrong and if she needed help. She said, that her legs hurt and that she was wrong to think that she could do this relay. Wow! I told myself, here I am in the company of a runner who had the guts to volunteer for this job and yet her body doesn’t want to cooperate. I have to help her finish what she started. I can’t just leave her here. So I told her “C’mon, let’s do this together.” I told guided her to where she’s not suppose to run (she was veering towards the vehicles to our right). I advised her to slow down if she still feels the pain. I told her to just run towards the finish line. Anonymous girl runner, who I now know as Aryan, and I sprinted towards the finish line. As soon as I crossed it, I was greeted with hugs and well wishes from runner friends. I felt Marga and Argo hug me. I apologized for screwing up our chance to win this relay. They told me I did well. How well, no one really knew. The clock wasn’t working. Nervousness made me forget to start my Garmin. I eagerly explained to them what happened and then I realized that I forgot all about Aryan. I went back to the finish line to check on her condition. She was white as a sheet. Ellen got her some ice and the medics took her to a nearby ambulance. After the race, it dawned on me that there were consequences to what I did. My teammates had to work harder to make up for the time I lost. I felt worse when Argo said, “You stopped? Why’d you stop? Oh no….Just kidding.” But we all know that jokes are half meant and of course I don’t blame Argo for that ;p It was true. I was initially upset at myself. I could’ve just called the attention of the marshall telling them that a runner needed help. The game wasn’t mine alone to lose. But I knew that the mommy in me would not allow that. Had I been in that situation again, I would’ve done the same thing but maybe sprinted and ran like hell during the last 100m or so. Haha! As I was walking to my car, Aryan called out to me and said she was feeling a lot better. Color had returned to her face and she was all smiles again. Sinking feeling zapped away. 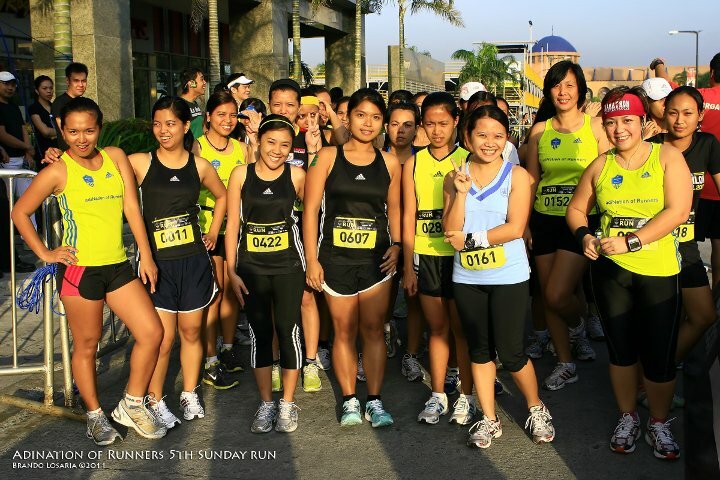 To the ANR 5th Sunday run event organizers, congratulations on a successful event! Looking forward to the next one. Today, my body is familiarly painful, my legs usually lobby and my mind is screaming for more happy juice. But, for tonight, I need to spend time with my kids and show them the mother in me. Tomorrow, I will tie the lace my running shoes again and run that familiar route towards fitness. Great write up Gail. But really, you did a good job. I need to memorize this line so I can use it too. LOL! Dyan ako nadali ni Argo! Hahaha! Noelle and I hate that radio ad! Grrrr! Glad that I tricked you on that line! lol! Anyway I’m proud of you Gail and the team! I know you would not let me down. Pero next time, huwag ka na tumigil ha! I just read this. Like what I said to you that Sunday, I am proud of what you and what you did! Woohoo!! Go mommy Gail! LOL! I’m sure it wasn’t me you were pertaining to! Haha!